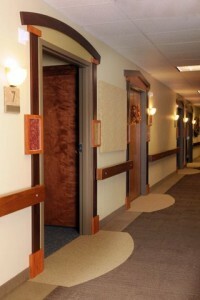 Our neighborhood, Featherstone Way, provides a secure environment for dementia and memory care. A maximum of 9 residents live in a family style setting. It is of utmost importance that we work closely with the family to create an environment with the resident’s own personal belongings in order to provide the highest possible quality of life. We have trained specialists for activities and care, including a certified Dementia Practitioner on staff.